The novel is a brilliant first-person narrative of the rise and fall of the Norse gods – retold from the point of view of the world’s ultimate trickster, Loki. It tells the story of Loki’s recruitment from the underworld of Chaos, his many exploits on behalf of his one-eyed master, Odin, through to his eventual betrayal of the gods and the fall of Asgard itself. 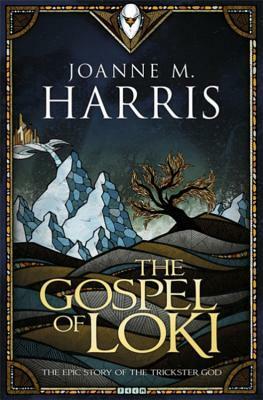 Using her life-long passion for the Norse myths, Joanne Harris has created a vibrant and powerful fantasy novel. I realized I might not have been the right audience for this book. My knowledge of Norse mythology is pretty skin deep. I could name you a few gods, but little else. Still, the concept of the rogue of the tales telling the story sounded appealing. There are two sides to every story, right? In hindsight, however, I think knowing is going to help your read here. This book, though told as a narrative, isn’t really a narrative. Once the book settles in, it quickly falls into a pattern. Loki mentions his current situation in Asgard (usually relating to how much of an outcast he is/isn’t at the time) followed by Loki talking about how a given event came to be, then how he used his wits to resolve the situation, followed by an update on his situation in Asgard. Lather, rinse, repeat. It’s a collection of stories only barely linked together by narration. To get the most out of it, I think you would benefit from knowing the other side of the tale, so you have that rounded view. As it is, Loki (naturally) comes off as the hero all the time and I think knowing the both so you can decide for yourself which version was closer to the truth (a narrator like Loki is going to be, by definition, unreliable). As it stands, Loki, the master of the humble brag doesn’t come off as terribly likable or sympathetic and I just found it hard to connect with the character, so I didn’t want to see his journey through. Aside from a few annoying seemingly anachronistic bit (i.e. Loki saying that at a certain point people were asking for his autograph) the writing of the book is solid and Loki does have a nicely distinct voice. I do think there is a real audience out there for this book and I think they can find a lot to like. As for myself? I just couldn’t get in to it and so I had to DNF it.